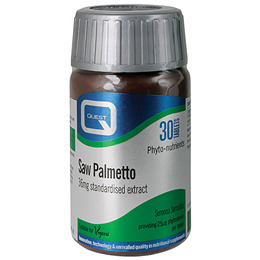 Quest Saw Palmetto is a standardised food supplement containing 36mg of saw palmetto extract providing 25mcg phytosterols per tablet. Saw palmetto contributes to normal prostate health. Why use Quest Saw Palmetto? May help to promote a healthy prostate and normal urination. Di-Calcium Phosphate, Bulking agent: Microcrystalline Cellulose, Saw Palmetto fruit extract, Magnesium Stearate, Glazing agent: hypromellose. Take one vegan tablet, one to three times daily with food. Swallow with water. Below are reviews of Quest Saw Palmetto 36mg Extract - 30 Vegan Tablets by bodykind customers. If you have tried this product we'd love to hear what you think so please leave a review.